Happy Monday! The sun is shining warm and bright today but it’s too bad I’m still battling with my cold! I had big plans to finish up my Guest Room Re-modelling project over the weekend, but it just didn’t happen. Our Guest Room is pretty much the only room left in the house to do any type of drastic make over (though I’m going to continuously update the decor in my house, it’s importantly to keep up to date!). 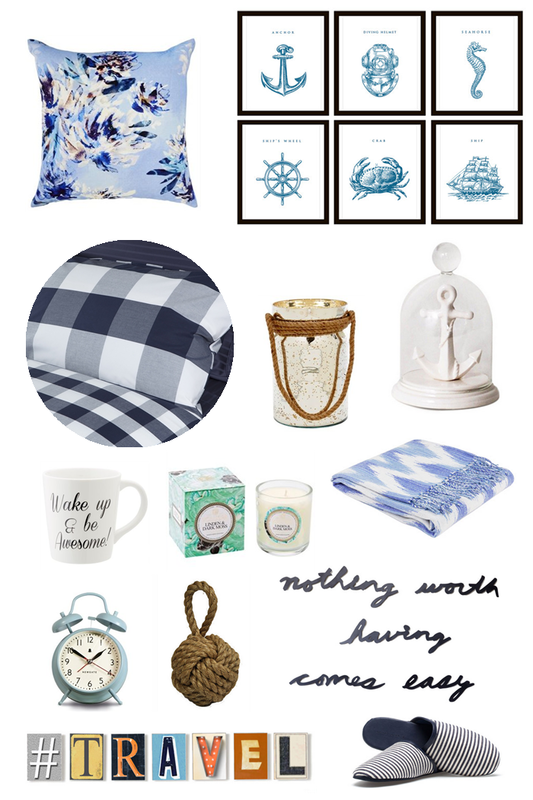 My vision for the Guest Room was to create an inviting nautical ambiance, think – soft blue hues and anchor/sea side accented decorations. The inspiration came from the set of 6 nautical themed prints (mine are in black outline) I acquired from this shop from Etsy. I then pretty much evolved all the other components around these 6 prints. I decided to pick a cottage style, plaid bedding set accented with powder blue cushions and a throw for the Spring/Summer season. In the Fall/Winter, the plaid bedding set will transform nicely with a fur or knit throw and even reds for the holiday season. A plaid print is extremely versatile. I also wanted to have some fun by adding some personalized wall art to the Guest Room. The letters in Marquee Wall Decor by Umbra is interchangeable! The set includes 7 frames and a full set of letters where you can switch out different words/phrases. What a nice added touch to greet your guest, no?! You can see my spin on it on Instagram. Are you re-modelling any part of your home in the near future? I’d love to hear some of your ideas! Please share by commenting below. Please stay tuned as I’ll be unveiling the before and after photos of our Guest Room. Can’t wait to share the results! In the mean time, have a fabulous start to your week! Found out about your blog from the Marilyn Dennis show and I love it. Congratulations on winning the thrift store challenge,for a moment there, I thought Amy had it in the bag but that just says so much about your work, even with tough competition you prevailed. Anyway, I am finishing up and sprucing up my living room. I live in an apartment and have not really done much since I moved.i have a colour scheme locked down, ( grey, green and yellow). These three colours come organically to me and materialize in different shades in my living room . I plan to document the makeover on my blog which I just started, please check it out. I hope comes close to your beautiful blog here in the future. In the meantime, blogs like your encourage me to work at it and not give up and that a lot can be done with and on less. Hi there! Thank you so much for your comment! I am so grateful for readers like you, truly keeps me motivated and continuing to share my love for DIY. I’d love to see your finished apartment update, the colours you picked are fantastic, I wish you the best of luck with it but most of all have fun!